Looking for the perfect home rowing machine? We've got you covered. 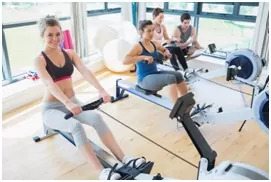 Investing in a rowing machine may be perfect to give you that extra push to build muscle, lose weight and improve your overall health. However, there are many to choose from which is why we've listed the best of the best to make your decision quicker and easier. The home rowing machine with compact footprint, adjustable gas-shock resistance, monitors shows time, stroke count, and calories burned, sturdy, steel frame construction and folds for easy storage. The Velocity CHR-2001 Rower features Drum Magnetic Control (DRM) and electronic tension control that produce the optimum friction needed to build muscle strength and enhance endurance. It is foldable, easily assembled and space saving. Flywheel design minimizes noise while maximizing a smooth feel. Includes the Performance Monitor 5, giving you accurate, comparable data for every row. Also features an adjustable monitor arm. Our ultimate guide to help you easily find the best home rowing machines to get you results!